WASHINGTON — An advisory group dubbed the “think tank” for the National Space Council formally kicked off its work June 19 with a broad but vague mandate to study space policy issues. The Users’ Advisory Group (UAG) of the National Space Council held its first meeting at NASA Headquarters, a five-hour “inaugural and, quite frankly, organizational session” of the committee, in the words of its chairman, retired U.S. Navy Adm. James Ellis. The UAG was included in the executive order signed by President Trump nearly a year ago reestablishing the space council, with members formally announced at the council’s second public meeting in February. Ellis noted that the prior incarnation of the National Space Council, during the administration of President George H.W. Bush more than a quarter-century ago, enabled the formation of a similar advisory group, but it never met. That could include the proposed establishment of a Space Force as a separate military branch, which President Trump announced at the June 18 space council meeting. During the meeting, UAG members asked Scott Pace, executive secretary of the National Space Council, what input the administration sought from the group regarding the Space Force. Pace responded that the four major issues regarding the Space Force were “people, money, acquisition and warfighting,” but didn’t elaborate on specific topics in those areas the council had questions about. He added that he expected to “see something in the FY20 budget as a start in that direction” towards establishing a Space Force. Ellis asked Pace for topics for “quick inputs” that that UAG could provide the council. Pace offered five potential topics, including strengthening public engagement, increasing commercialization activities in low Earth orbit, accelerating a return to the moon, identifying opportunities for international cooperation versus competition, and strengthening the relationship between science and exploration. No clear topics for consideration by the UAG emerged from its discussions, which also included presentations by the Commerce Department on regulatory reform and by NASA Administrator Jim Bridenstine on the agency’s activities. Ellis said that the UAG will establish six subcommittees, on exploration and discovery, national security space, economic development and the industrial base, technology and innovation, outreach and education, and space policy and international engagement. Chairs for those committees have been established, but UAG members won’t be assigned to those committees before next month. There are also changes to the UAG membership since Pence announced the “candidates” to serve on the group in February. Former House Speaker Newt Gingrich and former NASA Ames Research Center Director Pete Worden were on that original list, but are not on the current roster. The Wall Street Journal reported June 17, and other industry sources have since confirmed, that conflict of interest concerns kept both from joining the UAG. The UAG also includes one member not originally announced in February: Eric Schmidt, the former chief executive and executive chairman of Google who is currently a “visiting innovation fellow” at the Massachusetts Institute of Technology Media Lab. Ellis didn’t address the changes but did say that Gingrich was attending the meeting as a “distinguished advisor” who will support the UAG’s work in unspecified ways. The composition of the UAG prompted questions at the meeting from both members and the public. The membership is heavily weighted towards business, including presidents and chief executives of major aerospace companies and smaller firms. There are few members from academia or science, despite the interest from the council on ways to build up the links between science and exploration. During later discussions at the meeting, some members wondered if there should be participation from active-duty military members in order to address national security issues. 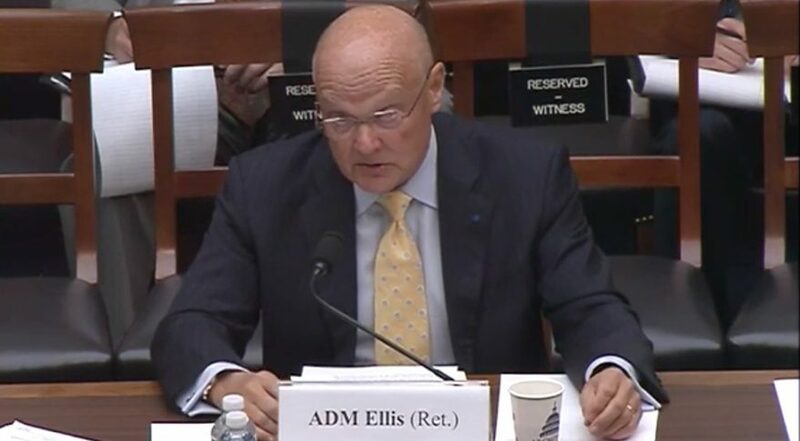 Ellis said those with past military experience, including himself and former U.S. Air Force Gen. Les Lyles, could provide that perspective for those issues. Other members of the UAG said they could offer perspectives from young professionals for the group’s deliberations. “I think I represent a pretty young group of folks at SpaceX, so I’m happy to carry their voice forward,” said SpaceX President Gwynne Shotwell, a UAG member.